Your imagination is one of the most powerful inner mental resources for self development. It is especially effective for facilitating and accelerating change – whether adapting to change, or changing patterns of how you think, act (and react), and feel. Best to take creative control of your images, lest they get the best of you. Much of how we are and what we do is dictated by images of our mind. We tend to think, feel and behave consistently with whatever self-image is dominant at the time. We tend to re-create outer conditions to match our inner conditions. This explains how most lotto winners are in worse debt than ever within one year of their big win. The advantage of practicing mental imagery is that it affords us the opportunity to practice that which we have little experience with, but upon which our success and wellbeing may depend. If you would prefer to be more in control over your destiny and less victim to history, then you need to take better control over the images of your mind. Neuroscience has demonstrated that mental imagery is a far more powerful tool than standard cognitive behavioural techniques (CBT) that involve self-talk and affirmations. The reach of mental imagery far exceeds words, and is the major portal of your brain for transformation and quantum leaping. Technically, according the science, applying mental imagery is virtually applied neuroplasticity. Whether you are seeking to improve your health; relationships; performance in sports, business or on stage; how you react to challenges and pressure — this book is for you. 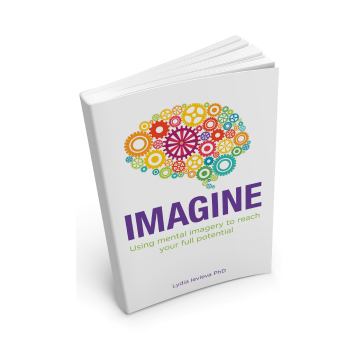 Imagine: Using mental imagery to reach your full potential. optimal experiences for enhancing wellbeing in the present, and projecting to future challenges and opportunities. Lydia Ievleva: Best Future Self 2. Best Future Self (13:19): Drawing upon the wisdom of your best future self. Lydia Ievleva: Rewriting History 3. Rewriting History (10:18): Transcending old (bad) habits and recalibrating emotional reactivity into a more optimal range—accelerating the change to becoming more aligned with your best self. Lydia Ievleva: Inner Healing 4. Inner Healing* (17:00): Mobilizing your body’s healing resources to the fullest. 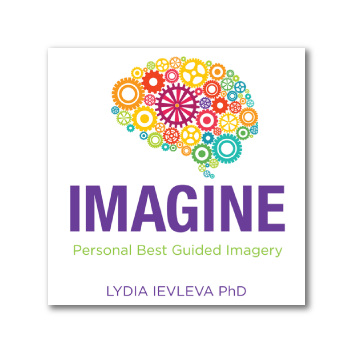 available on IMAGINE: Personal Best. * Music by Lee Stillwell, a musician/composer based in Tallahassee, FL. 1. Personal Best – full version (23:58): Imagining all the steps necessary to reaching your dream goals. essentials to reaching your goals. 3. Peak Performance Recall (17:23): Drawing on previous peak performances to enhance preparation and capacity for future events. Lydia Ievleva: Rewriting History4. Rewriting History (10:18): Helping you to transcend old (bad) habits and recalibrating emotional reactivity into a more optimal range—accelerating the change to becoming more aligned with your best self. optimize your health and wellbeing. Lydia Ievleva: Inner Healing 2. Inner Healing (music: Joleyost) (17:00) Guided healing imagery to mobilize your body’s healing resources to the fullest. MP3 availability coming soon via iTunes and other outlets. 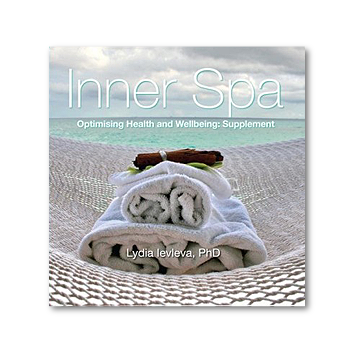 Inner Spa Supplement provides an overview of the mental techniques for enhancing your inner capacity to generate the wonderful feelings associated with being at a spa retreat. It is intended to supplement the guided imagery exercises on the Inner Spa Guided Imagery album/cd. Learn about harnessing the cornucopia of your mind/body/spirit connection to optimize your health and wellbeing. Lydia Ievleva 1. Relax to Max! (20:40) Learn the basics about relaxation and meditation techniques, and how they can benefit your health, performance and wellbeing. Lydia Ievleva 2. Mental Skills Applied to Healing and Recovery (08:04) Learn how to apply mental skills to enhance recovery from injury and illness.